Air duct cleaning is one of the things one must take care of at homes and businesses in order to restore and maintain high air quality. It is also required in order to ensure the wellbeing of those who reside or stay at the property in question, whether it is a home, a clothing store, an office, a school or any other structure. We at Duct & Attic Cleaning Experts offer professional air duct cleaning services for both residential and commercial buildings of any size. Here's some information about our services. When we deliver expert air duct cleaning services, our technicians thoroughly clean the air duct system and ductwork at your home or business. We will ensure that the system's filters are changed with new ones, we will clean the dust laying within it and we will clean the whole area, including all associated parts. We will reach anything interfering with the air quality at the property, and free blocks caused by dirt build-up, debris, dead rodents, etc. When the air duct system is working but the house or business remain under-ventilated; When you hear noises coming from the air duct system; And when it gets hard to breathe while you're staying at your own home or business and the air feels a little dusty, moldy or stale. These all might indicate that the air quality may be reduced and it is best to have it checked by professionals. It is recommended to have cleaning done professionally once a year or more often when it comes to commercial buildings such as schools, hotels and restaurants. Our technicians are all professionals who are experienced with performing all services offered by our company. But professionalism is not enough on its own, as we also equip our technicians with the latest products and tools in order for them to be able to perfectly execute the required service. Additionally, we believe in personal, trustworthy service, to guarantee our customers' satisfaction each and every time they contact our technicians and call for our services. Because the health of the building's occupants is at your hands! Clean ducts mean breathing cleaner air, less health issues, less breathing complications and a much cleaner and efficient house or business! What are different types of ducts? Ducts are tube-shaped conduits that deliver and remove hot or cold air. They can be flexible or rigid, and can be made of a variety of materials. Flexible ducts usually consist of a wire coil, covered with a plastic liner and insulation material. They are convenient, cheap and can fit into difficult areas, but they are not energy efficient and are easily destructible. Rigid ducts can come in different shapes, usually either cylindrical or rectangular, and can be made of sheet metal (galvanized steel or aluminum) or fiberboard. Sheet metal units sometimes have a fiberglass lining, either internally or externally, which serves to increase energy efficiency and reduce the noise, while the fiberboard ones are made of compressed fiberglass, covered with a foil laminate moisture-protection. They are often used in cooling and heating systems but not in regular ventilation. 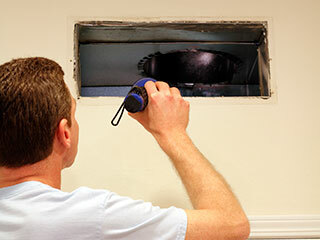 This type of task should be part of the regular maintenance of any home that has heating, cooling and ventilation ducts. Over time, dirt, debris, and cobwebs accumulate inside the ductwork, negatively affecting the air quality and potentially even becoming a fire hazard. Cleaning them will reduce the level of dust and airborne contaminants throughout the entire household, which will help prevent respiratory issues and maintain a fresh and clean indoor air quality. This can also increase the efficiency of the HVAC system, and subsequently save you money on energy.